I thought yesterday was pretty productive. Not only did I finish knitting the bodies for three small round guys, but I also finished up this drawing of Cody, the large furry friend of Emily at merrypad.com. Mostly I put up monsters here in the bloggy part of the site, but I also wanted to let you know that I love doing custom portraits of people and animals. I updated the "PORTRAIT INFO" tab up top to include examples of my work and pricing. Buffalo's First Saturday Artist Market at the Central Wharf! Hello all, especially anyone new stopping here after visiting today's S.A.M. Citybration event! I hope you thought the event was as much fun as I did! A bunch of monsters found new homes and the weather was perfect! The monsters even found some airtime tonight on Channel 4 News as some "local treasures of a different kind." How exciting is that!? I've never actually been on TV, but today I managed to stumble through a brief interview while shaking like a leaf. Here's some screenshots and the whole video can be found HERE. See? 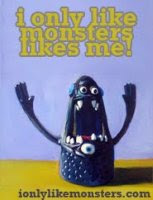 The monsters just want to make you smile. Let's all be happy for a little while. Thanks to everyone who came out to make this event super fun and successful! And if you missed it, there's MORE! The Saturday Artist Market is ongoing throughout the summer. I listed all the dates I'll be attending in the WHERE TO BUY tab up top.